In Napoleon’s palaces and beyond, aesthetics served politics but also achieved greatness. Andrea Appiani, Portrait of Napoleon Bonaparte, First Consul, in the Uniform of a General in the Army of Italy, 1801, oil on canvas. 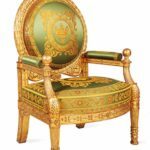 Pierre-Antoine Bellangé, Presentation armchair for the Grand Salon of the King of Rome’s apartment at the Tuileries, intended for the Emperor and Empress, ca. 1804–15, gilded wood, silk. 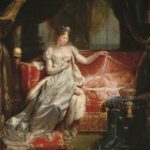 Joseph Franque, The Empress Marie-Louise Watching Over the Sleeping King of Rome, presented at the Salon of 1812, 1811, oil on canvas. The French Revolution, Alexis de Tocqueville observed, was “so inevitable yet completely unforeseen.” The crisis of 1789 was inevitable because the social and intellectual life of 18th-century France had fallen “out of kilter” with its oligarchic political system and its indebted economy. The development of the Revolution from reform to regicide and democracy to tyranny might have been foreseeable in theory. Plato had warned in the Republic that oligarchic government decayed into democracy and tyranny. In 1790, when the Revolution was still in its first phase of constitutional reform, Edmund Burke’s Reflections on the Revolution in France had predicted that France would become a modern tyranny. No one, though, could have foreseen the rise of Napoleon Bonaparte from provincial artillery officer to emperor. Bonaparte embodied the attributes that Tocqueville detected in the Revolution, but in fulfilling its aspirations for a new society Napoleon destroyed its ideal of liberty. The Revolution that began with liberté, égalité, fraternité led to mass executions, civil war, and secret police, and then, in 1804, to the rise of a modern Caesar. 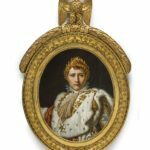 “Napoleon: Art and Court Life in the Imperial Palace,” on view at the Montreal Museum of Fine Arts through May 6, reconstructs the iconography of Napoleon’s brief but transformative residence at the Château de Fontainebleau, near Paris, through more than 250 objects. 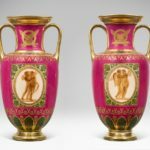 Curated by Sylvain Cordier of the Montreal MFA, with the participation of the Musée Château de Fontainebleau, the exhibition is a lavish visual demonstration of the historical paradox that Tocqueville saw at the heart of the Revolution. Before 1789, France had been a centralizing autocracy, fostering an uneasy mixture of Enlightenment ideals and a cult of hereditary leadership. After 1804, it became one again. The distribution of land and authority had changed, and so had the legal code and the ruling dynasty, but the state remained paramount and the centralization of power had intensified. The velocity of change after 1789, Tocqueville believed, had derived from the accumulated momentum of reform before 1789. Before the Revolution, Fontainebleau served as a stage for the Bourbon monarchy’s more relaxed performances. Etiquette was less strict than at the Palace of Versailles. Each autumn, the estate offered ideal country for hunting and riding. The château’s attractions included a theater and a Classically-themed silver Boudoir de la Reine, a private space between the king and queen’s bedchambers in which Marie Antoinette could receive her friends. After 1789, the royal furniture was sold off and Fontainebleau converted into a military academy. In November 1803, Napoleon visited to inspect the academy and its cadets. Napoleon was then the first among equals of the three Consuls who ruled France. Pursuing his Classical theme, he was preparing to declare himself emperor and the Bonaparte family the fount of a new dynasty. In June 1804, he gave orders for the restoration of Fontainebleau as an autumnal hunting lodge, just as it had been under the Bourbon kings. He returned in November 1804, when he was en route for Paris and the Cathedral of Notre-Dame, where he expected Pope Pius VII to crown him Emperor of the French. When the pope wavered, Napoleon crowned himself. Fontainebleau bore the fingerprints of France’s kings: Francis I’s long gallery, with its frescoes by Rosso Fiorentino; Henri II’s ballroom, with the arms of his wife, Catherine de’ Medici, on the walls and ceiling, along with the discreet monogram of his mistress, Diane de Poitiers; Henri IV’s wing and his Jeu de Paume indoor tennis court; and Louis XIV’s Grand Parterre, said to be the largest planned garden in Europe. Napoleon, the legislator who remade France and Europe, now remade Fontainebleau in his image as a key institution of his empire. The imperial initial “N,” surrounded by a laurel wreath, was welded onto the front gates. 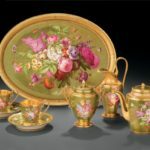 Egyptian motifs recalled the loot and ambitions of Napoleon’s invasion of Egypt in 1795, though not its ignominious end in 1798, when the hero sailed for France, leaving his plague-sick army behind. A wing was pulled down to make the entrance more stately. A new empress, Josephine, installed new furniture in the silver boudoir. The Empire Style predated Napoleon in inspiration, and postdated him in terminology. The formal roots of French Neoclassicism lie in the glorification of Louis XIV (1643–1715), who centralized his power at the Palace of Versailles and glamorized his Bourbon family by association with the arts of ancient Rome. French Neoclassicism was named “Empire Style” during the Second Empire, the reign of Napoleon’s nephew Louis Napoleon (1851–71), a triumph of style over content whose rule ended, like that of his uncle, in defeat at the hands of the Prussians and exile in a location chosen by the British. The stage for Napoleon’s empire was that of Louis XIV, explicitly in the Tuileries Palace in central Paris and with greater subtlety at Fontainebleau. Long before 1789, the French refurbishment of Classical motifs had spread across the courts of Europe. Through Napoleon’s conquests, the aesthetic handbook had taken political form. 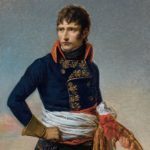 By writing a new European corpus of law, the Napoleonic Code, and dispatching his brothers and sisters to fill the thrones of his subject kingdoms, Napoleon recast Europe in the legal and dynastic image of France. The French Classical style now embodied Europe’s new order. The combination of imperial imagery and a dynamic emperor was capable of shaping political reality. In 1806, when Napoleon retaliated against Britain’s blockade of France’s ports by declaring the Continental System, he created the first unitary European economy since the Roman Empire. Napoleon’s official architects, Charles Percier and Pierre-Léonard Fontaine, had already updated the austere lines and lavish gilding of Bourbon Classicism for the Empress Josephine’s chateau at Malmaison, near Paris. They intended Fontainebleau to become the quintessential expression of the French style. The emperor’s relatives arrived to flesh out the dynasty, and an army of servants established the Imperial Household, a new court which both revived and reinvented the royal household. The Imperial Household consisted of six departments, each headed by a grand marshal. The grand chaplain negotiated matters spiritual, the grand master of the hunt organized matters equestrian, and the grand marshal of the palace, the grand master of ceremonies, the grand chamberlain, and the grand equerry choreographed the orbit of pageantry around the emperor’s body. Napoleon was not an absolute monarch like Louis XIV. “L’état, c’est moi,” the Sun King had said: “I am the state.” The Revolution had replaced custom and divine right with a constitution. Though Napoleon frequently displayed authoritarian contempt for procedure, he was technically a constitutional monarch. If Pius VII wavered in the Cathedral of Notre-Dame, it was because Napoleon had gained authority by might, not right. He had not been sanctified by royal birth or sacred inheritance, like the kings of the Ancien Régime. The display of Napoleon’s legitimacy changed to reflect his inheritance of the Revolution. Historically, sacred inheritance had been staged in the site of its reproduction in the private royal apartments: the royal bedchamber. In the Grand Appartement du Roi at Versailles, Louis XIV had Classicized this medieval model, with a sequence of increasingly impressive chambers leading to the center of the mis-en-scène, the royal bedchamber, with the bed as its altar of consecration. In Napoleon’s Fontainebleau, however, the throne room became the central stage. Authority, instead of being constituted in the body of the king, was legally conferred upon the sovereign by the constitution and by enthronement. Before the Revolution, the royal bedchamber was attended by the aristocracy; now, the throne room is the apex of the institutions of government. The emperor in his throne room is a spectacle of modern power. In 1701, Hyacinthe Rigaud’s Portrait de Louis XIV en costume de sacre had represented the Sun King in his “sacral robes” of coronation. The throne before which Louis XIV stood was merely a chair, and the Classical setting was as grand and unreal as the mythological activities on the foreshore of a Claude sunset. Monarchic power was wherever the monarch happened to be, and the throne was wherever he sat. In 1806, it was not sufficient that Jean-Auguste-Dominique Ingres depicted Napoleon enthroned in his sacral costume. The frontal presentation and scepter in Ingres’ portrait echoed the Olympian Zeus of Phidias, the pantocrator (“world-ruler”) of Byzantine iconography, God the Father from Hubert and Jan van Eyck’s Ghent Altarpiece, and Charlemagne, the medieval Holy Roman Emperor. This modern spectacle resurrected the trappings of sacred legitimacy from the costume trunk of the older orders. The tasks of the Imperial Household included the commission and funding of a new iconography. The opening sequence of “Art and Court Life in the Imperial Palace” describes the mutation of Napoleon’s image. The First Consul is the general who has become the head of state in order to save the republic and finish the Revolution. One portrait, reflecting the search for a new imagery of republican power, echoes Gilbert Stuart’s full-length 1796 portrait of George Washington. After 1804, the republican image dissolves rapidly, and the figure of the imperial monarch emerges. An explicit historical precedent is a bust of the Augustus, the emperor who became a god, loaned to the exhibition from the Louvre. Napoleon disapproved of the Ingres portrait. Ingres erred by an excess of Classicism. In flattering earthly power, he had revealed the heavenly sources of political legitimacy. The Revolution had annulled the Church’s sanction when it had nationalized the Church’s lands and sacked the altars. Did Napoleon dismiss Ingres’ image for its clerical nostalgia, or because it revealed his usurpation? 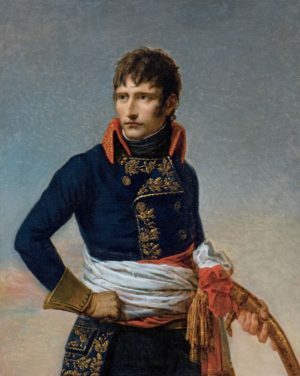 Napoleon preferred the contemporaneous portrait by François Gerard. As the pupil of David, the official artist of the Revolution, Gerard had the right aesthetic pedigree and the right iconographic impulse. Gerard’s Napoléon I en costume de sacre is staged in the throne room at Fontainebleau, in front of the real throne. The emperor’s head may have been painted after the Louvre’s bust of Augustus. “It is legal because I wish it,” Louis XIV had explained. But Napoleon’s imperial wish was not fulfilled in law. His empire lasted little more than 10 years before he met his Waterloo. Many of Percier and Fontaine’s designs for Fontainebleau remained paper dreams. Fontainebleau, Napoleon said, was “a house for the ages,” but he was not able to remake it for his age and image. The Napoleonic additions to Fontainebleau exist in the ambience of Louis XIV. As “Art and Court Life in the Imperial Palace” illustrates with loans from McGill University, a counter-flow of images cartooned Napoleon as a tyrant.